The programme of the 2013 congress of IKT, the International Association of Curators of Contemporary Art, included meetings at the Centro de Arte Dos de Mayo in Móstoles as well as at Centro Cultural Matadero Madrid and the Museo Nacional Centro de Arte Reina Sofia, where the IKT Members Forum, Symposium and General Assembly were held. "Curating Value", the topic of this year's symposium organised by Brussels-based independent curator Zoë Gray, included the participation of Barnabás Bencsik (the recently forced-out director of the Ludwig Museum in Budapest), French artist Pierre Bismuth, Spanish curator and consultant María de Corral, London-based curator and theorist Dr. Simon Sheikh and Greek artist and Athens Biennial co-director, Poka-Yio. Following is our photo diary documenting a few moments of these five days in Madrid alongside the organisers' schedule, starting the Pre-Congress programme on Thursday afternoon with a first meeting at Espacio Trapézio at the Mercado de San Antón and ending on Monday morning with the Post-Congress programme which included studio visits to Fernando Sánchez Castillo and Cristina Lucas. Buses depart from Plaza del Emperador Carlos V/ Atocha (opposite the renowned El Brillante bar) for Centro de Arte Dos de Mayo (CA2M) in Móstoles. 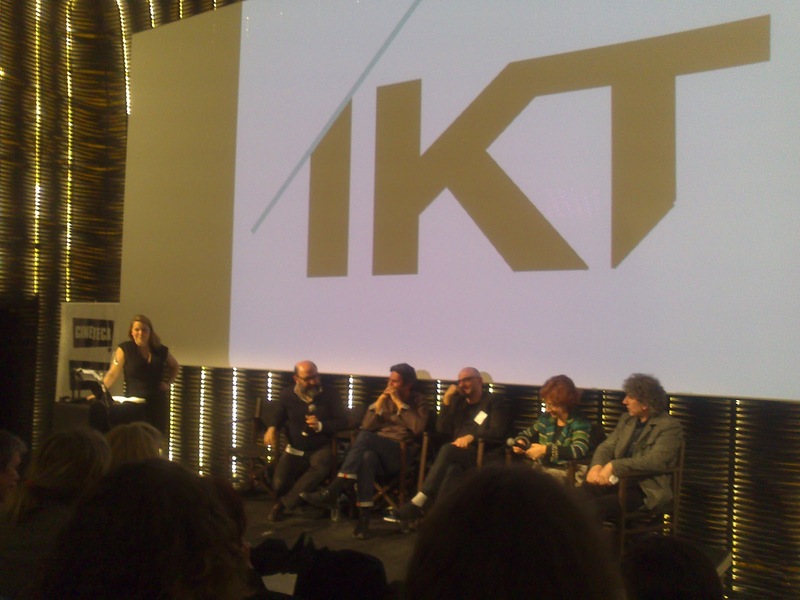 IKT Members Forum. Opening of the congress, welcome and greetings. 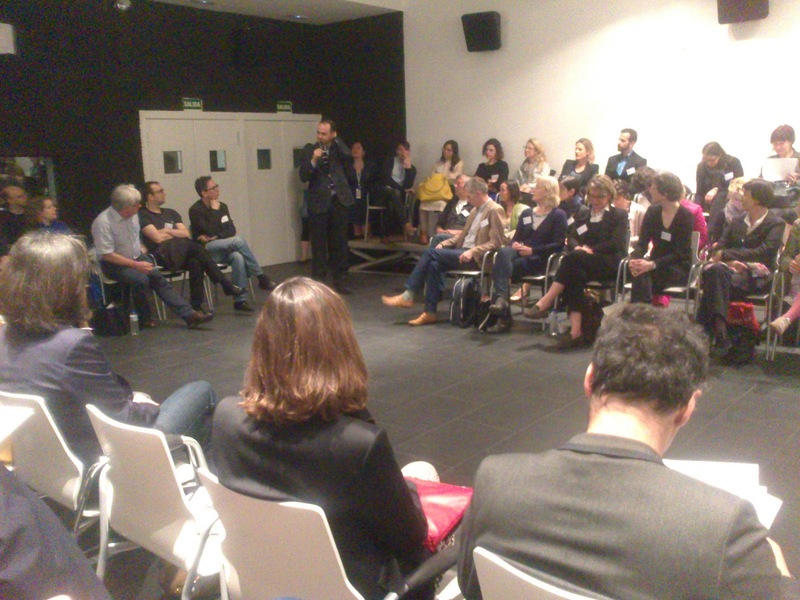 Each of the +/- 120 members and guests had 90 seconds to introduce themselves to the rest and quickly explain what projects they were currently developing. 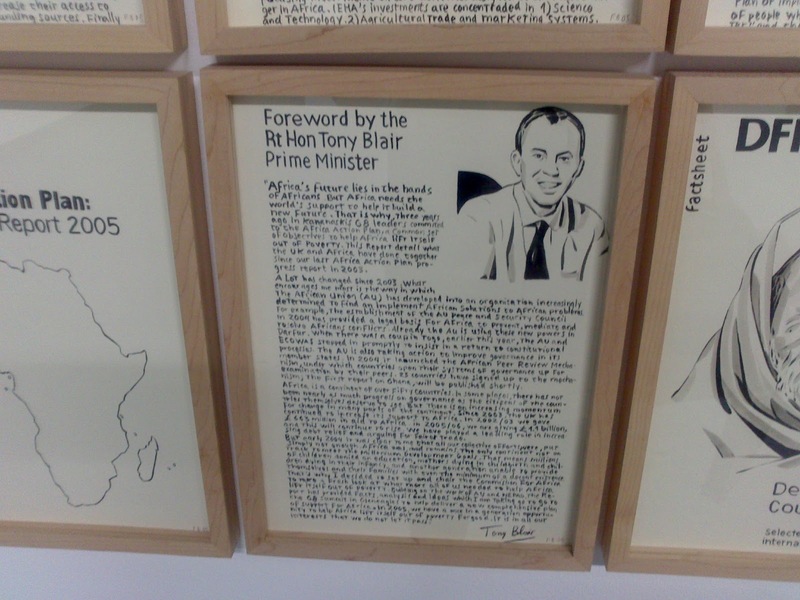 Exhibition visits: Pop Politics: Activismos a 33 revoluciones curated by Iván López Munuera and Hailil Altindere curated by CA2M Director, Ferran Barenblit. 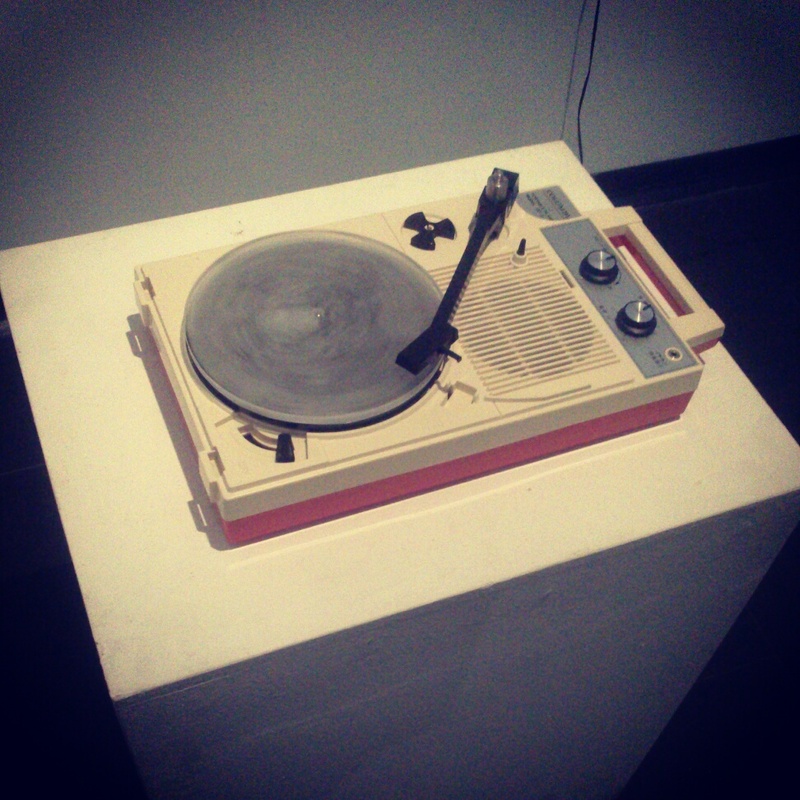 Lyota Yagi, Vinyl (2005) plays the melodies of Debussy's “Clair de Lune” and “Moon River” by Johnny Mercer and Henry Mancini on a record player from a record made of ice created with a silicon mould. 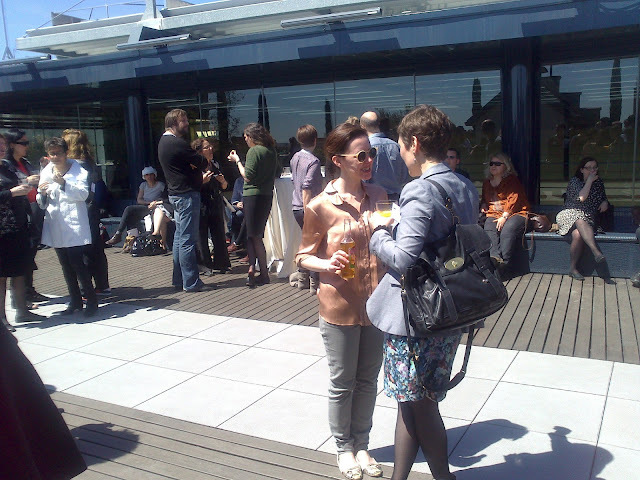 Lunch offered by CA2M at the Terrace. 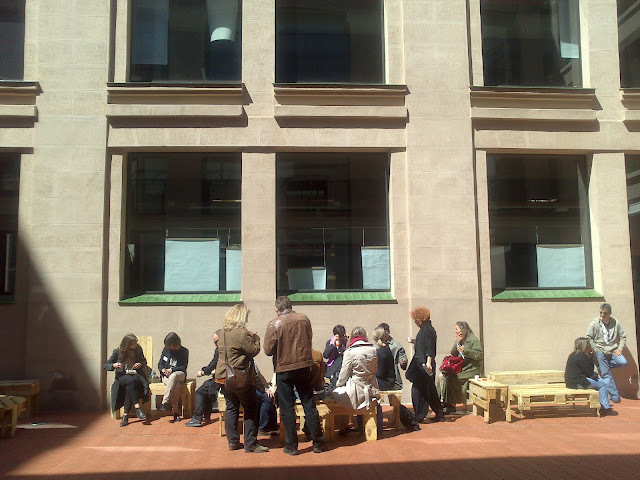 Buses depart for Fundación Banco Santander (Boadilla del Monte) to visit the exhibition "Out of the House. 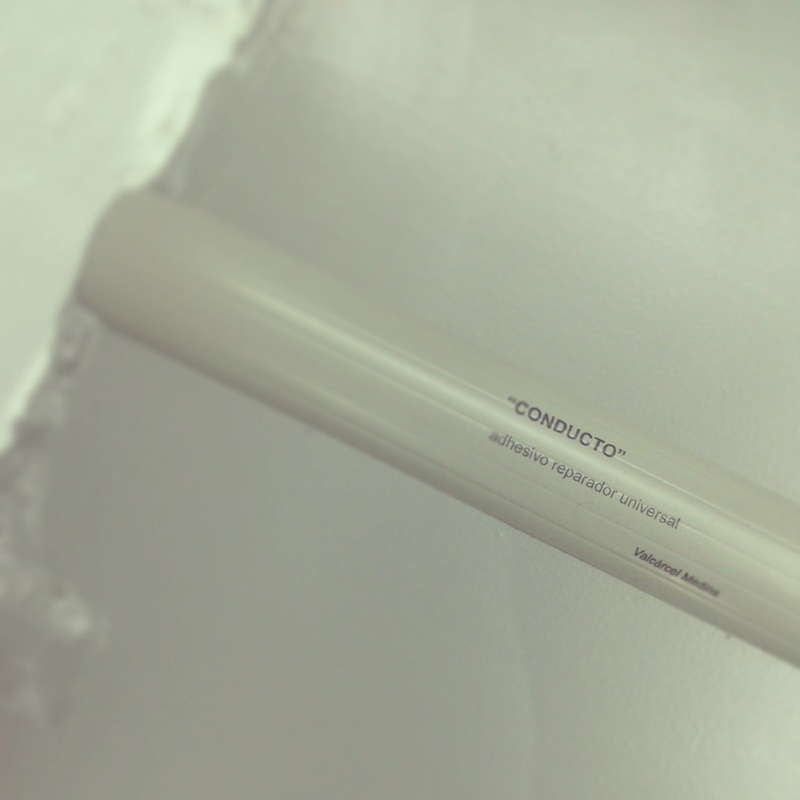 Contemporary Art Cranford Collection", curated by Anne Pontégnie and Muriel Salem. 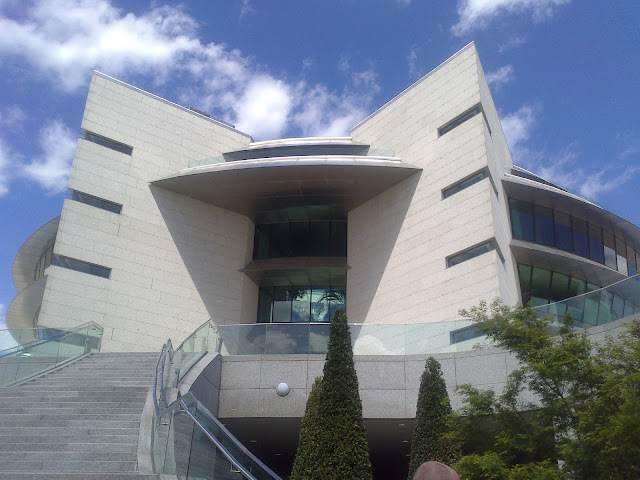 Sci-Fi-like building of the Fundación Banco Santander in the Ciudad Financiera, Boadilla del Monte. 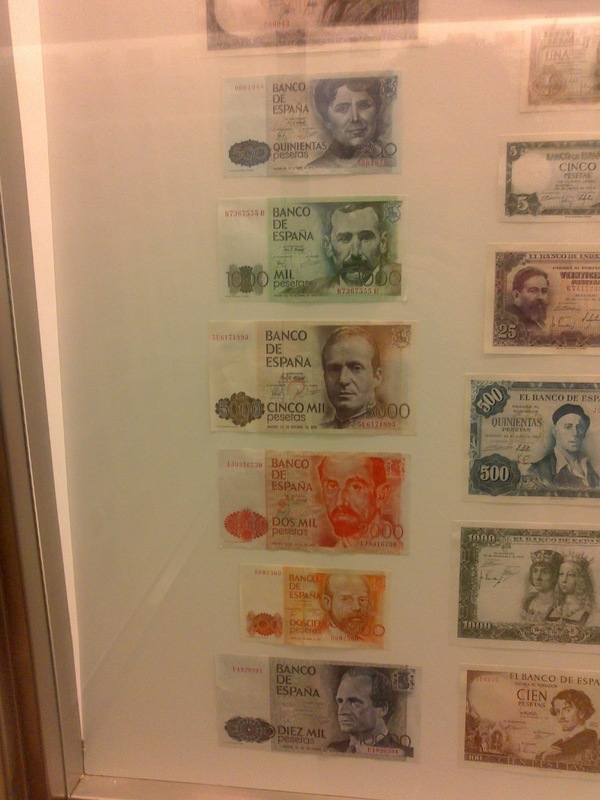 The exhibition space holds a collection of Spanish currency. Here, the last pesetas notes that used to circulate before 2002. View of the galleries presenting London's Cranford Collection. 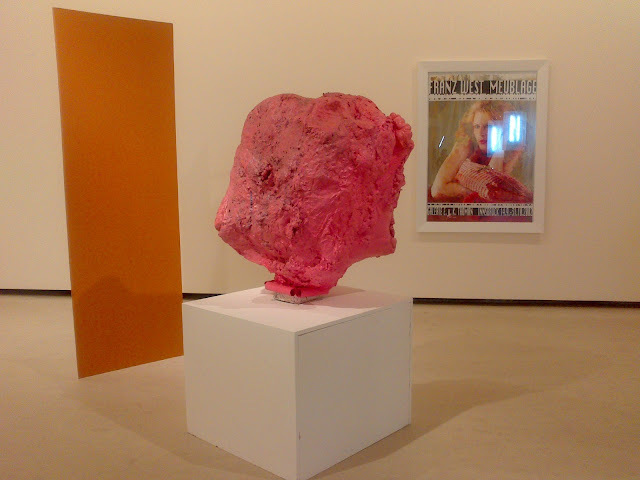 Holdings include mostly British art (Sarah Lucas, Rachel Whiteread, Damien Hirst, Phil Collins, Paul Noble, Eva Rothschild, Rebecca Warren, Gillian Wearing), but also pieces by Franz West, Albert Oehlen, Martin Kippenberger, Pierre Huyghe and Thomas Schütte. You can also visit it virtually. 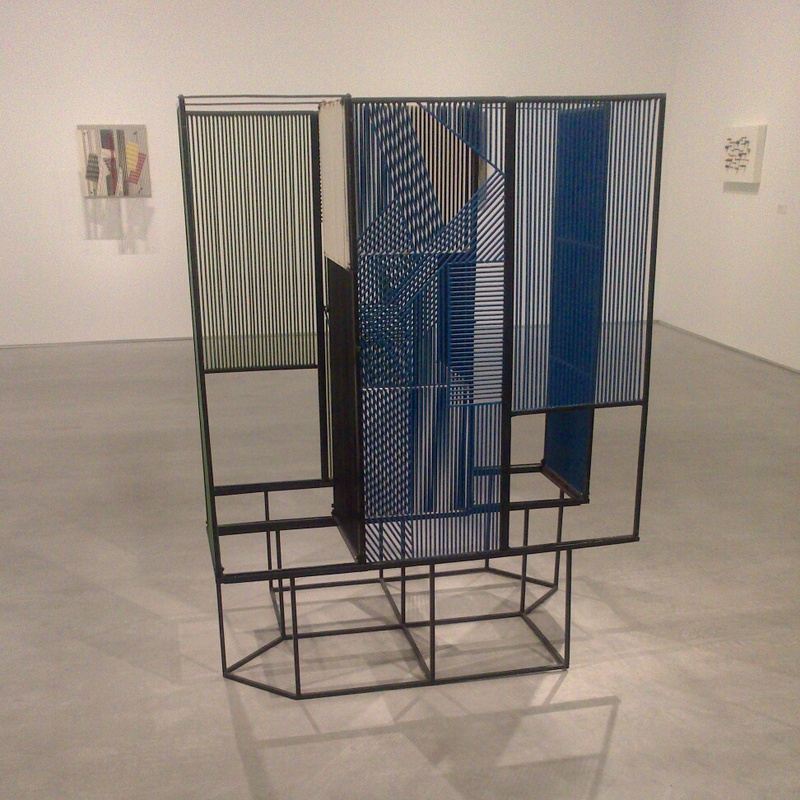 More blue chip works, by Damien Hirst (Something or Nothing, 2004). 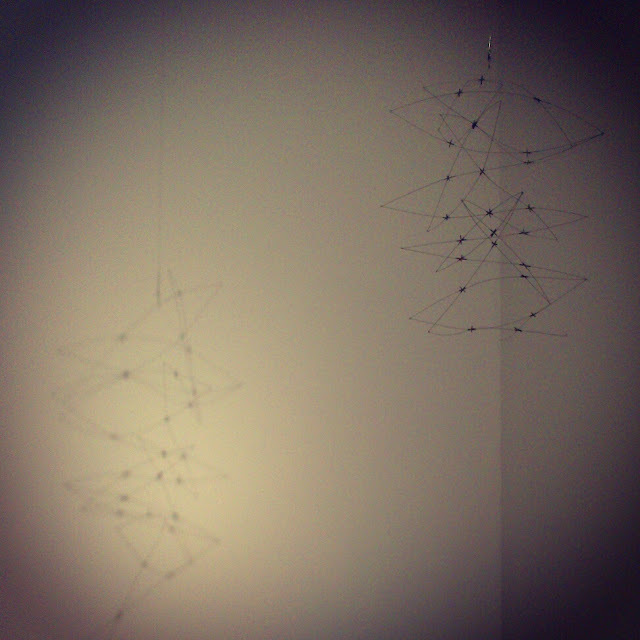 Our Love Is Like the Flowers, the Rain, the Sea and the Hours, 2002 by Martin Boyce. 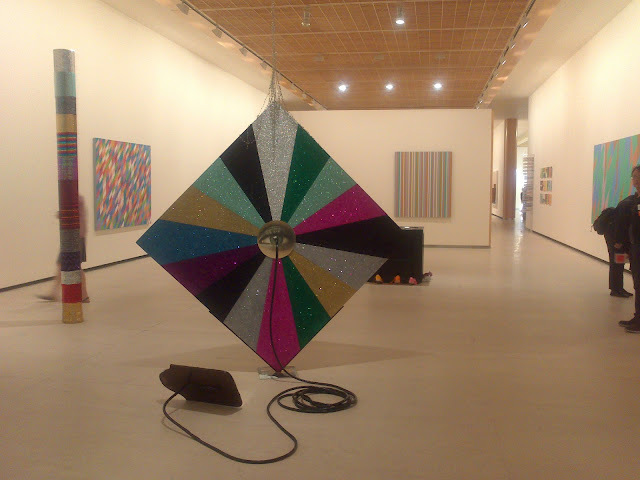 (Foreground) Jim Lambie's Sweet Exorcist, 2005. 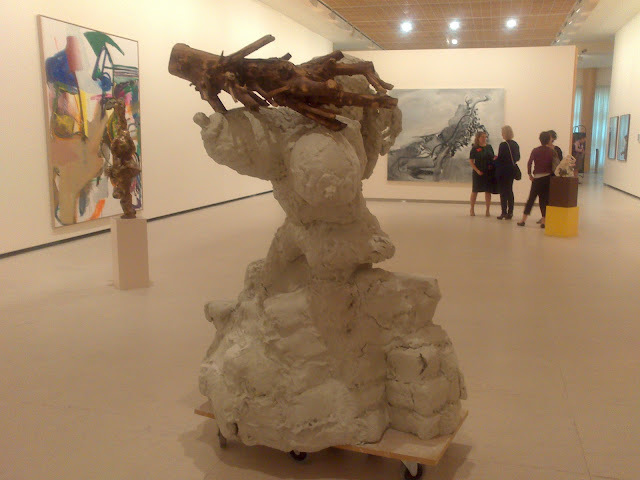 (Foreground) Rebeca Warren, Log Lady, 2003. Buses depart for Ivory Press. 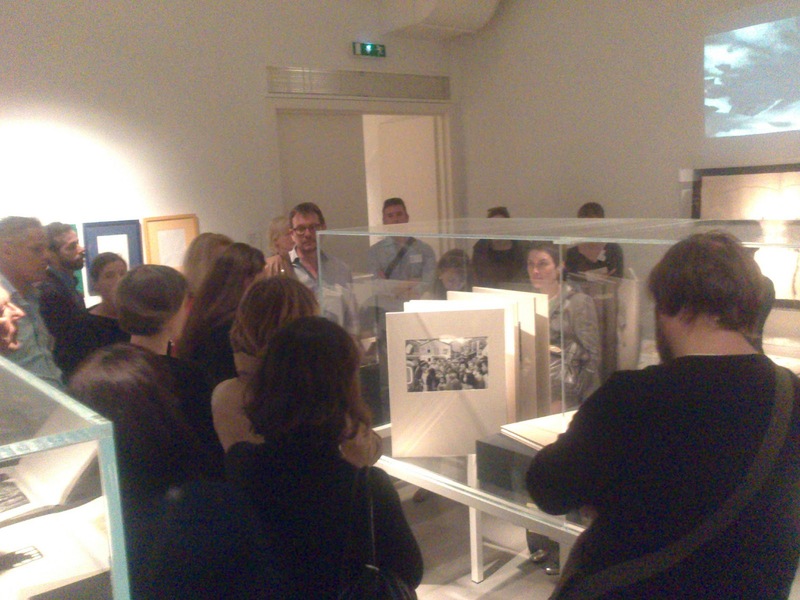 Exhibition visit: Ilya & Emilia Kabakov. 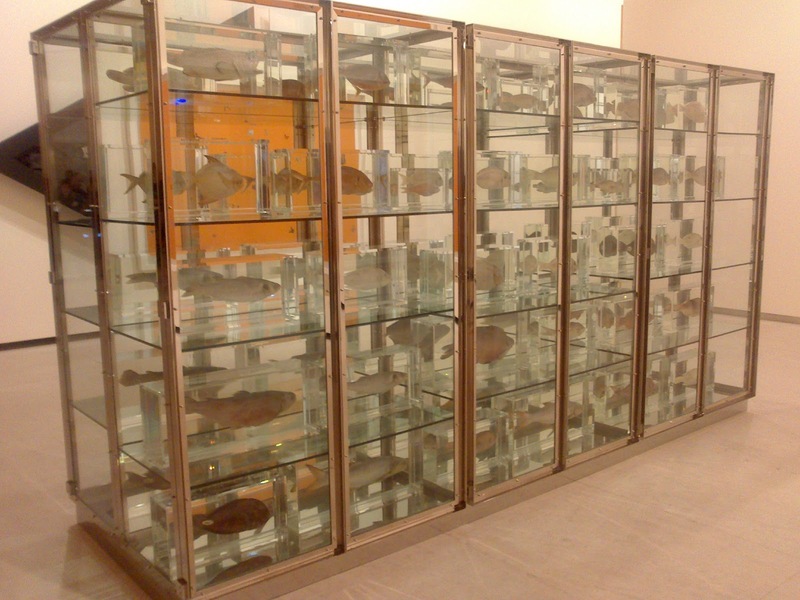 ...and of course Damien Hirst (again). 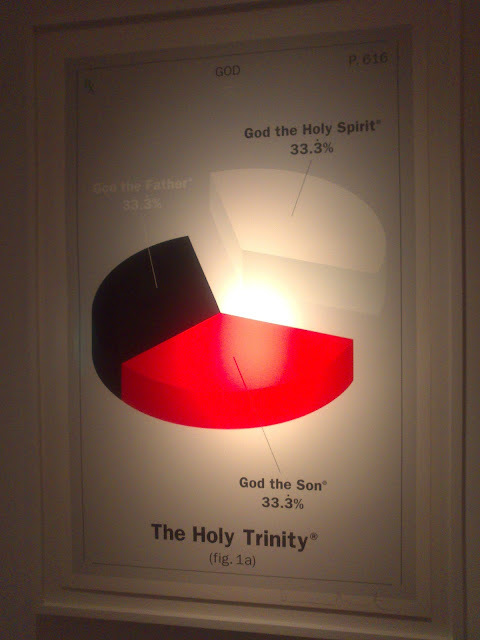 Here The Holy Trinity explained in percentages, a part of a much larger sculptural/archive piece produced by Ivory Press. 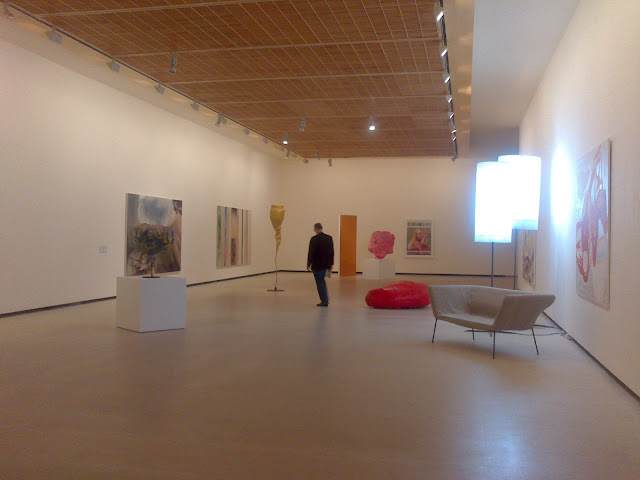 View of Ilya & Emilia Kabakov's show Vertical Paintings and Other Worlds. 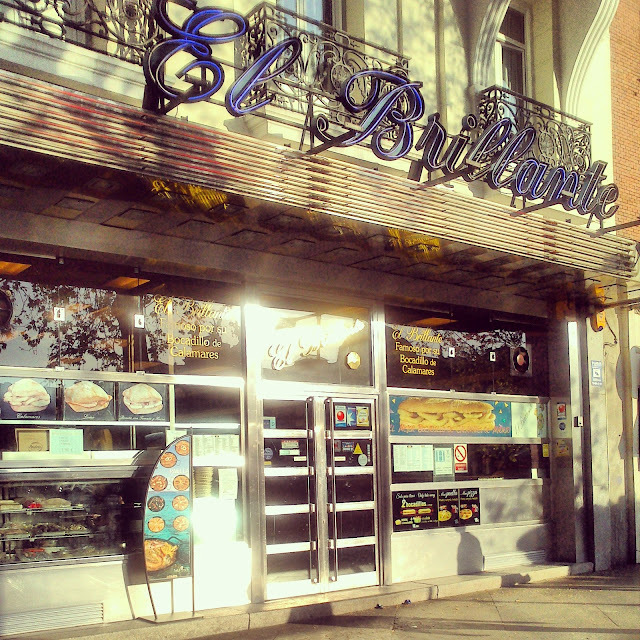 Walk to Galería Liebre. Exhibition visit: Ideas y presupuestos. 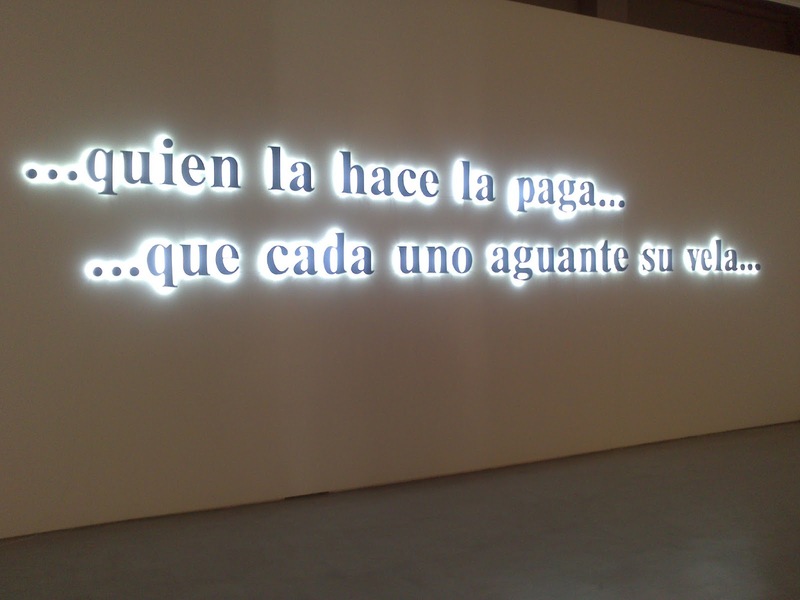 Curator: Martí Manen. 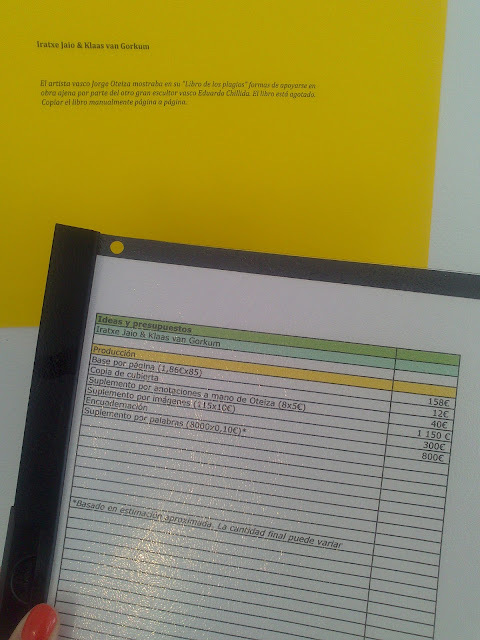 Ideas and budgets for possible artworks by artists Sebastian Beyro, Black Tulip, Bonus Extra, Kalle Brolin, Priscila Fernandes, Guillem Juan Sancho, Sandra Paula Fernández, Ana García Pineda, Luis Pérez Calvo, Iratxe Jaio & Klaas van Gorkum, Laramascoto, Connie Mendoza, Carlos Motta, Carl Palm, Pepo Salazar, Yes. Visit to the Tabacalera Espacio Promoción del Arte. 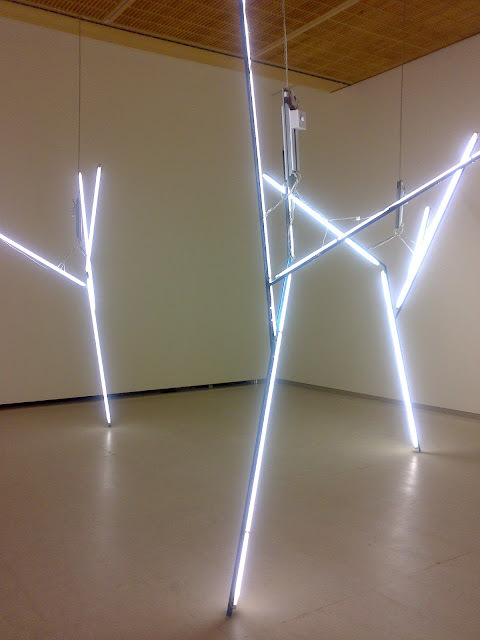 Exhibition visit: José Manuel Ballester “Bosques de Luz”. Curators: María de Corral and Lorena Martínez de Corral. 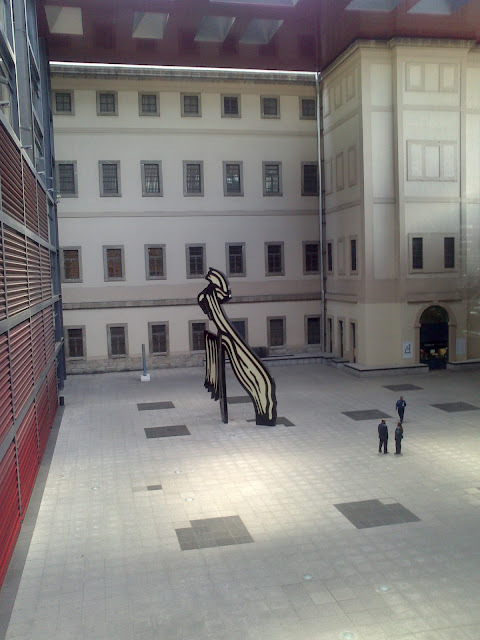 Entrance to Tabacalera, Espacio Promoción de Arte. Tabacalera also shares spaces with La Tabacalera Centro Social Autogestionado (follow @latabacalera), where over 30 organisations self-manage their own spaces sharing, garden areas, storage, a stage, bar facilities, etc. Caixaforum. Exhibition: 'Maestros del Caos. 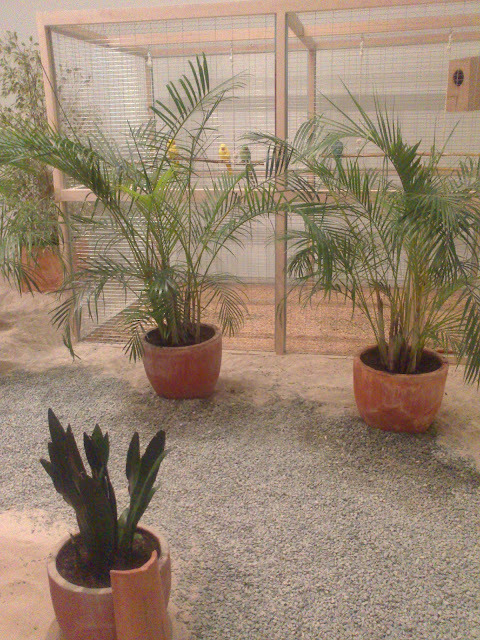 Artistas y Chamanes'. Walk to Medialab Prado, Calle Alameda 15, which officially opened its doors a day before our visit. Walk to La Casa Encendida, Ronda de Valencia 2. 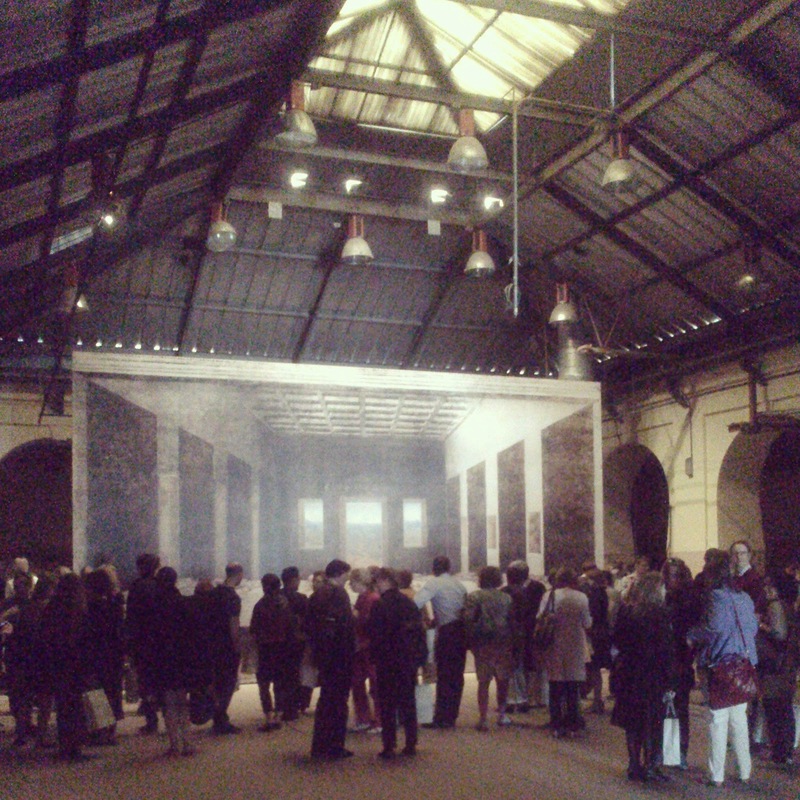 Exhibitions: Generaciones 2013. 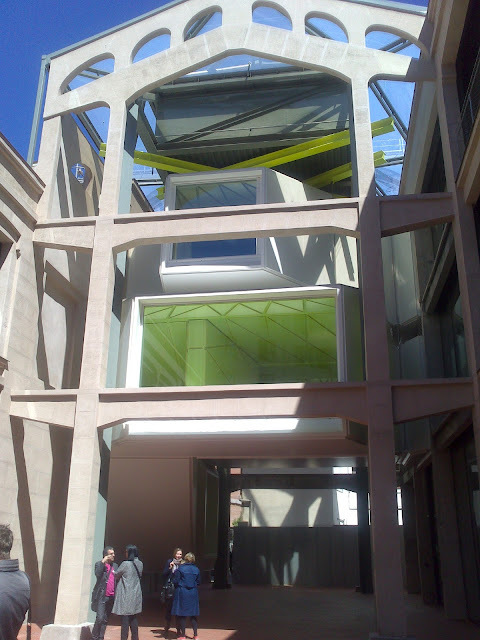 Proyectos de Arte Caja Madrid. Albert Oehlen, Moderne Farbkonzepte. Curator: Christian Domínguez. Lunch offered by La Casa Encendida in their terrace. 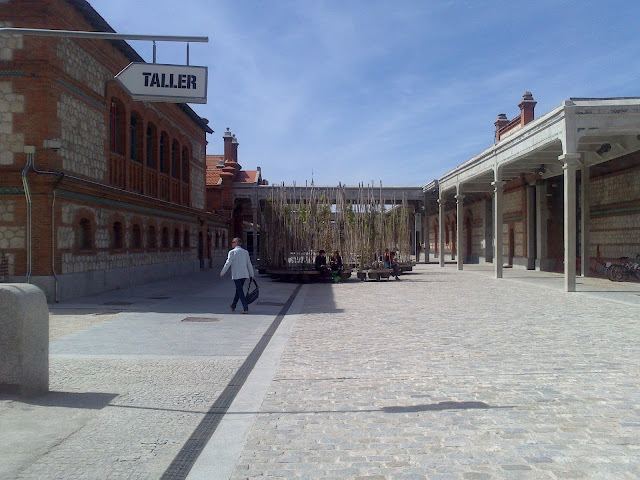 Buses depart for Matadero Madrid, Plaza de Legazpi 1, 28045 Madrid. 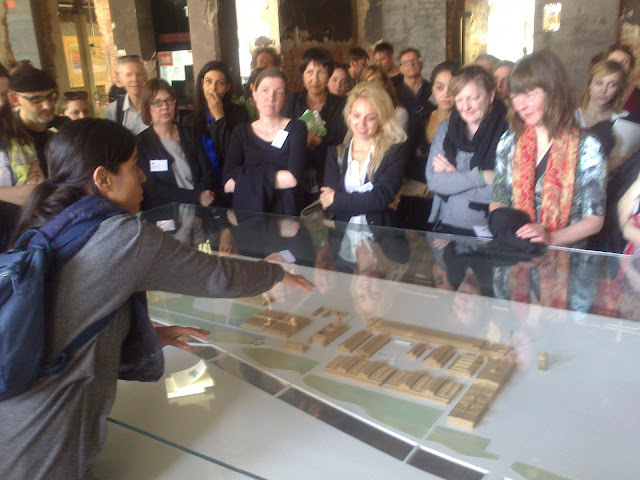 Manuela Villa, Head of Contents at Matadero introduces the different areas of the 80,000m2 of the former slaughterhouse and its programmes, including the Programa de Pensamiento Matadero Madrid; Intermediae Laboratory for the production of projects and social innovation and Archivo de Creadores (Documentation of 150 Madrid-based contemporary artists). 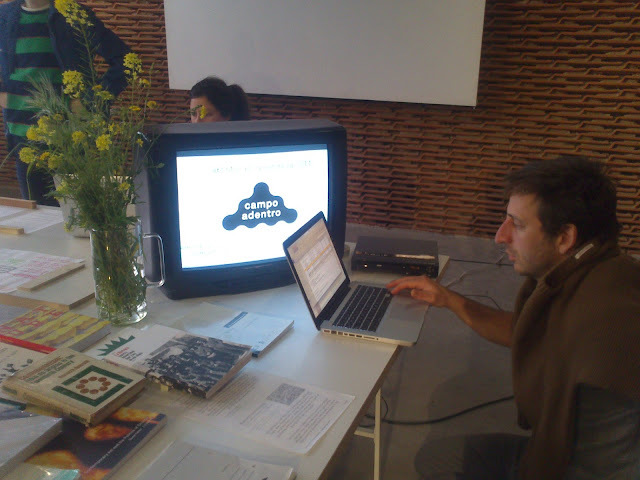 Fernando García-Dory of Campo Adentro working at Matadero Madrid. 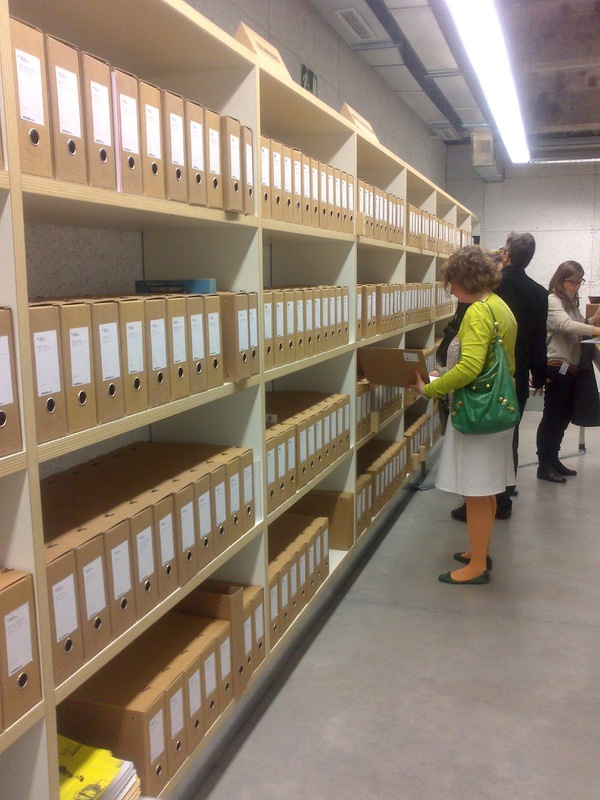 Archivo de Creadores de Madrid, offering "physical and online documentation on 150 young artists or collectives of 17 different nationalities with links to the city of Madrid." 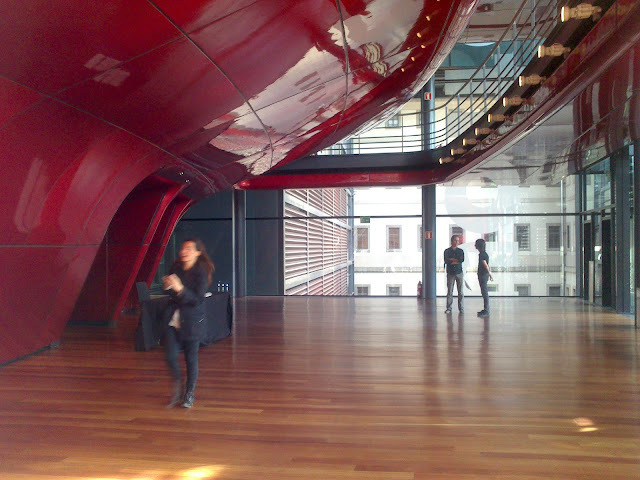 IKT Symposium “Curating Value” at the Cineteca. "Curating Value" symposium at the Cineteca, Matadero Madrid. 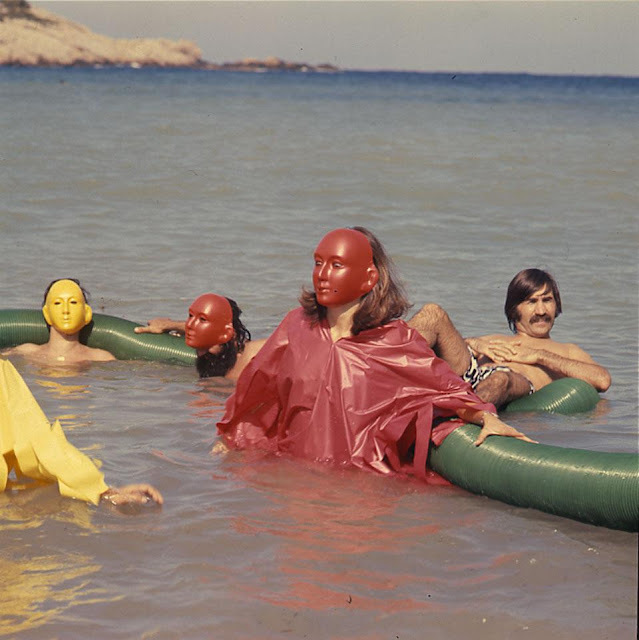 Left to right: Zoë Gray, Pierre Bismuth, Dr. Simon Sheikh Poka-Yio, Maria de Corral and Barnabás Bencsik. 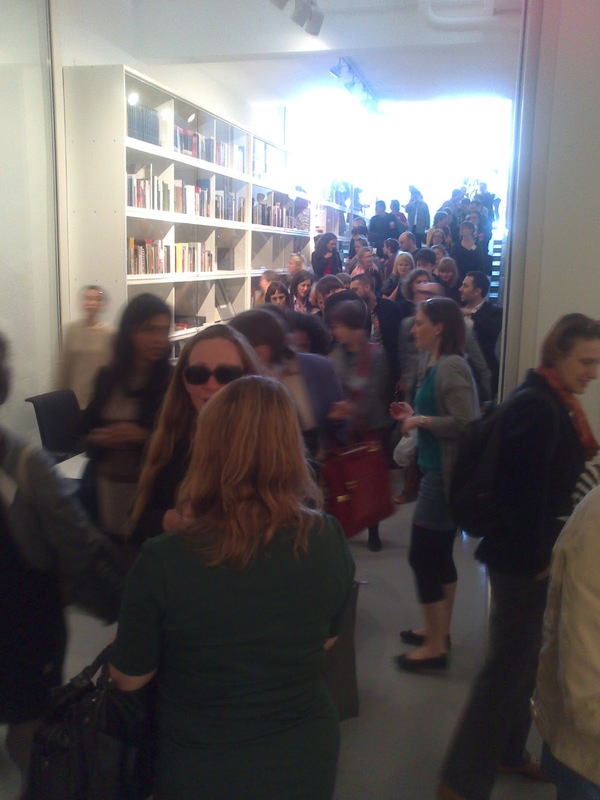 Exhibition visits. 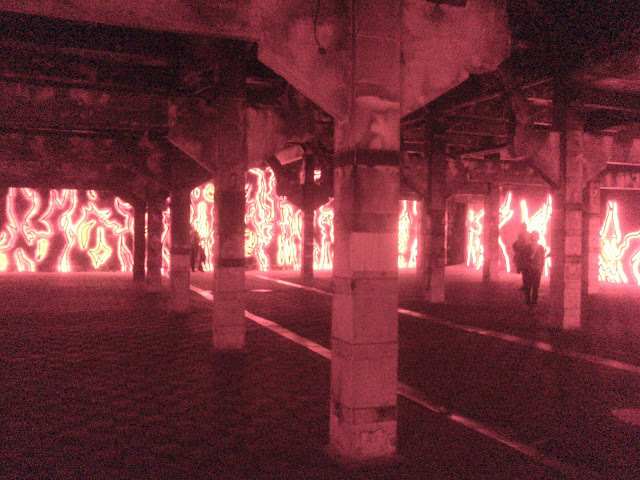 Abierto x Obras: Candela. 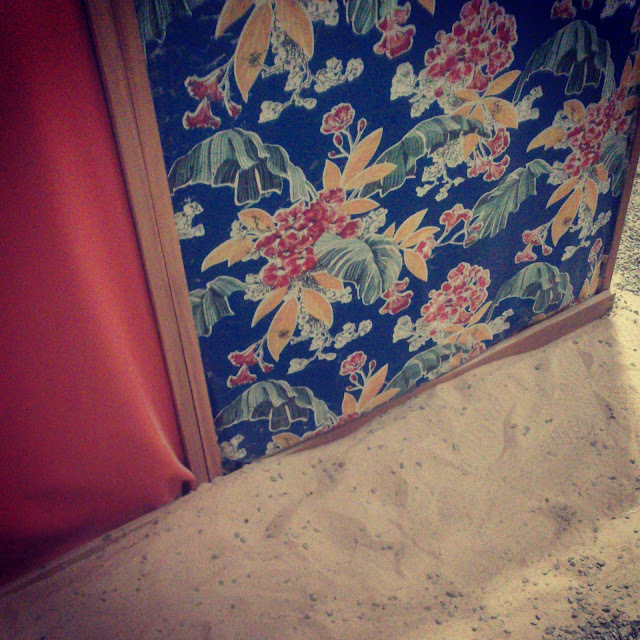 Los Carpinteros . Curator: Manuela Villa; and Arqueológica, curated by Virginia Torrente. 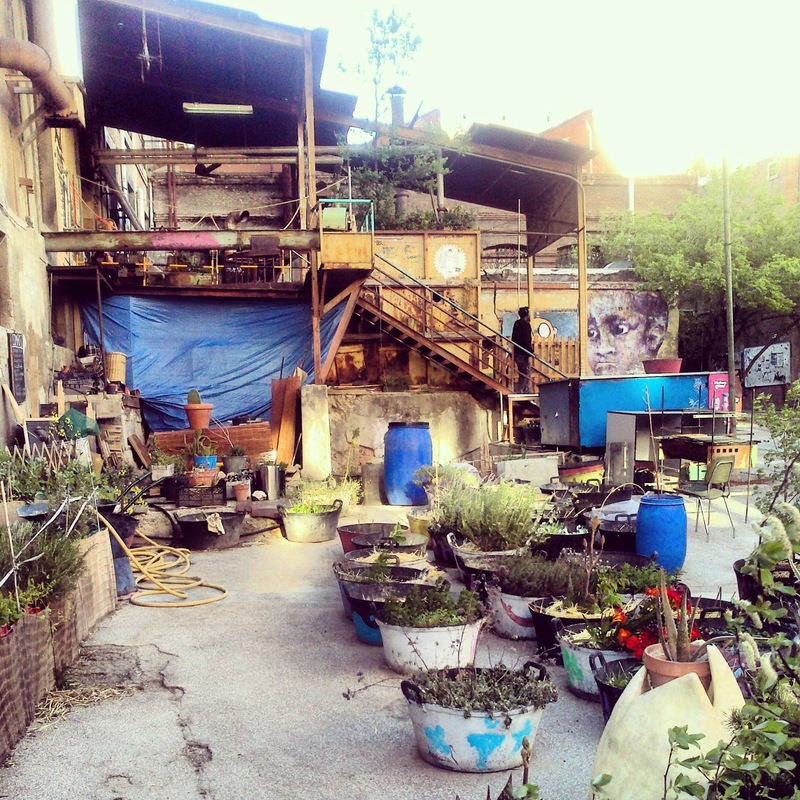 Followed by a dinner and party offered by Matadero Madrid. Candela, site-specific work by Los Carpinteros at the Abierto x Obras space. 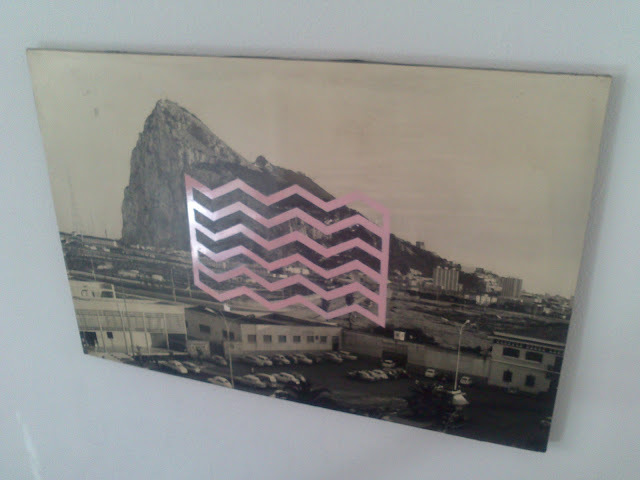 Pedro Barateiro's piece The Negative Reader, 2012-13, included in the group exhibition Arqueológica in Nave 16. 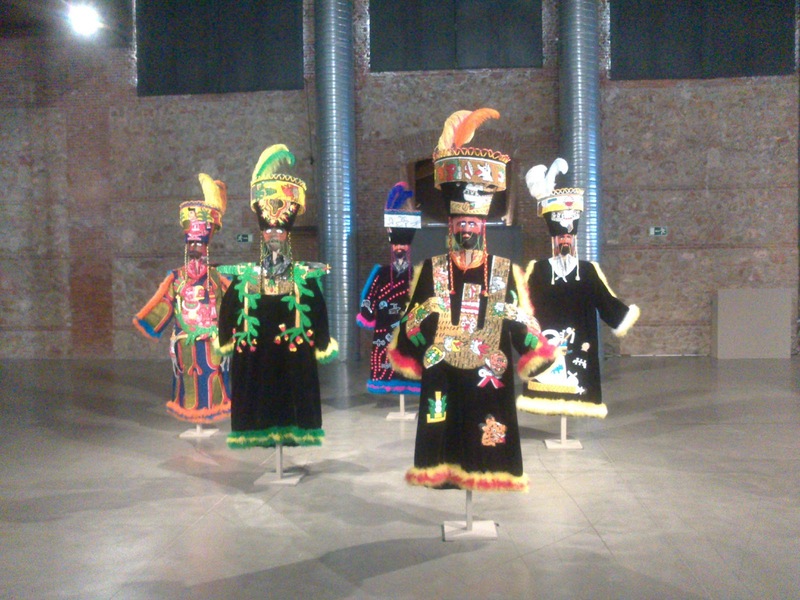 Mariana Castillo Deball, five dance costumes produced by artisans in Yautepec in Morelos, used to perform the Brinco de los Chinelos dance during the Carnival. 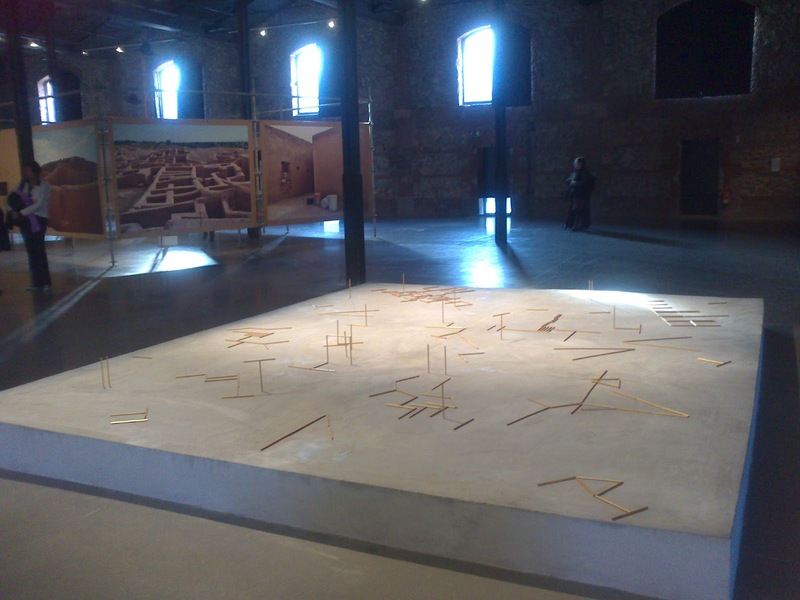 Part of the group exhibition Arqueológica in Nave 16. 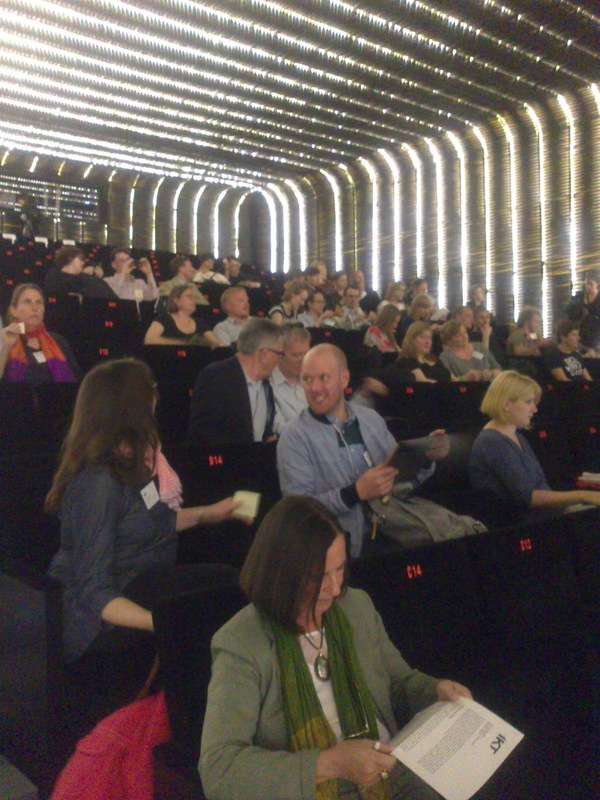 IKT General Assembly in the Auditorio 200, Museo Nacional Centro de Arte Reina Sofía (MNCARS). 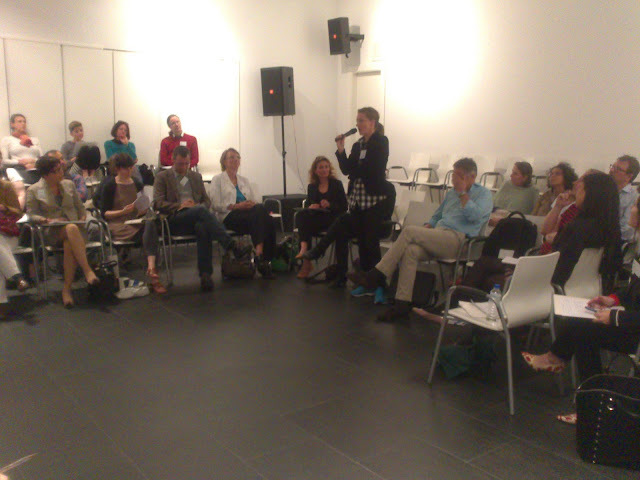 One of the issues to discuss during the General Assembly was to decide on the next venue/city to host the IKT Congress 2014 and 2015. The members voted that CCA Derry-Londonderry would host the 2014 event (the bid included visiting the biennial Eva International in Limerick) and that Vienna's Kunsthalle Wien to host the following year. Here Johan Lundh co-director of CCA Derry-Londonderry during his presentation for Derry-Londonderry to host the 2014 IKT Congress. 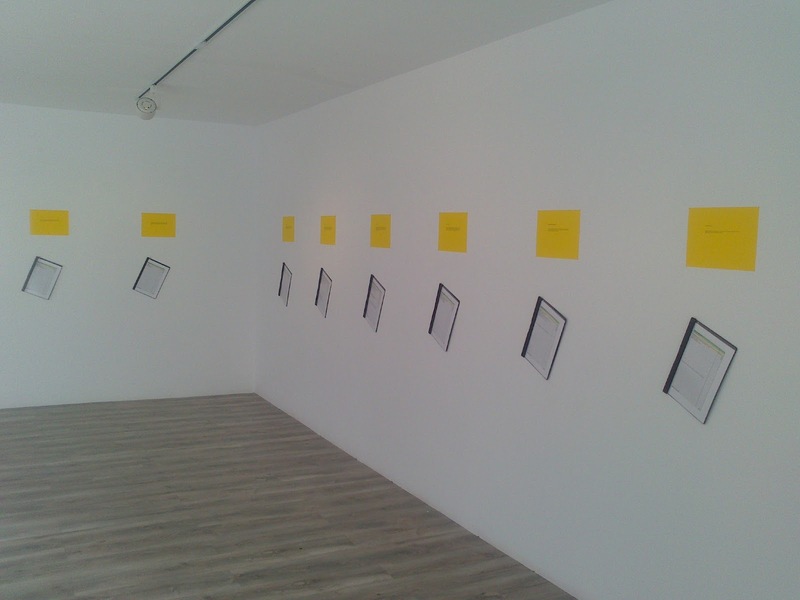 Exhibition visits: Colección I. 1900-1945; Colección II. 1945-1968; Colección III. 1962-1982; Cristina Iglesias; Robert Adams. el lugar donde vivimos. Una selección retrospectiva de fotografías; La invención concreta. Colección Patricia Phelps de Cisneros; and Azucena Vieites. 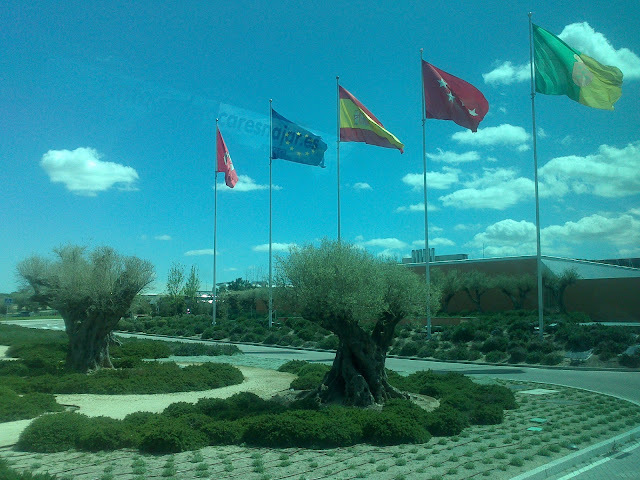 (Programa Fisuras). Favourite Gego mobile, "Reticularea" (1973–76), in the Colección Patricia Phelps de Cisneros. Favourite Jesús Soto, "Pre-penetrable" from 1957 in the Colección Patricia Phelps de Cisneros. Wonderful 1967 Tropicália by Hélio Oiticica in the "Colección III, 1962-1982" (above and below). NoguerasBlanchard, with the exhibition "Can’t Hear My Eyes" curated by Niekolaas Johannes Lekkerkerk. 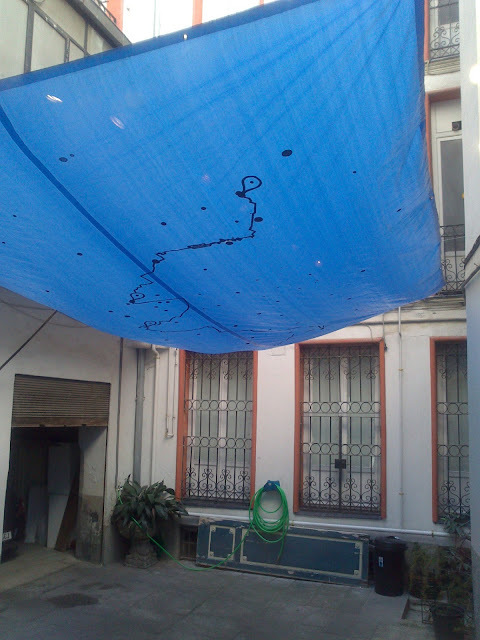 MaisterraValbuena, with the exhibition "Entre lo fugitivo y lo infinito" curated by Anja Isabel Schneider. Isidoro Valcárcel–Medina, Conducto, 2013. From the press release: "On the occasion of this exhibition project, Isidoro Valcárcel Medina proposes a site-specific intervention on the floor in the gallerys entrance zone. With a critical, at times provocative stance towards the art market, voiced among others in Ley del Arte - Ley reguladora del ejercicio, disfrute y comercialización del Arte (1992), Valcárcel Medinas work sees art and life interrelated, inviting the spectator above all to an experience." García Galería with the exhibition "En la zona gris" curated by Virginia Torrente. 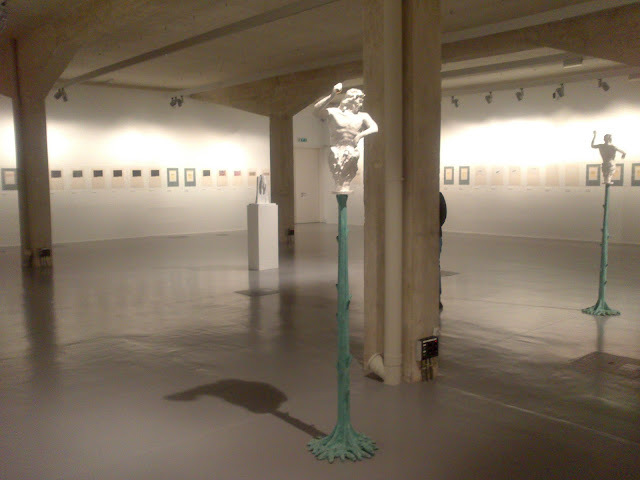 Moisés Pérez Albéniz with an exhibition of Antoni Muntadas (below). Helga de Alvear with an exhibition of works by Prudencio Irazabal. Fúcares, with the exhibition "Escópico-Esconder(se)-Escaparcurated" by Juan Francisco Rueda. 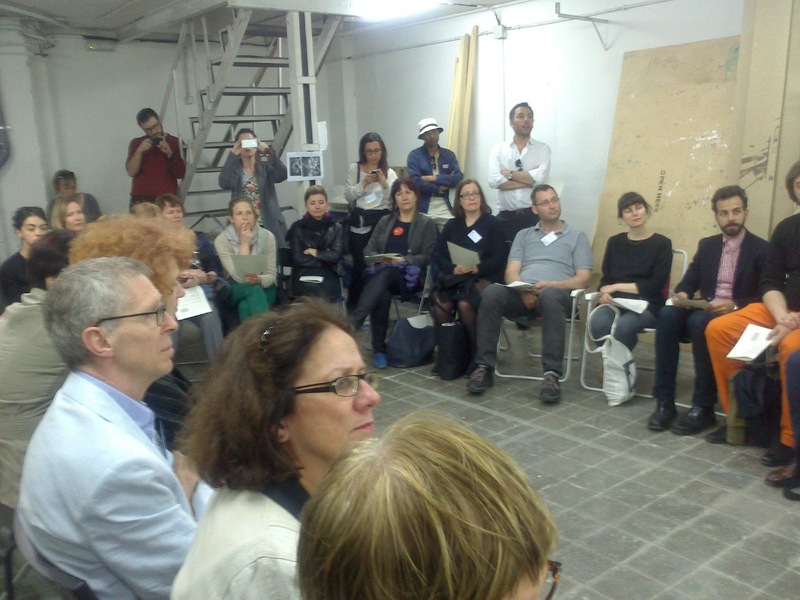 Visit to artists studios at Rampa in the Carabanchel neighbourhood, Madrid. 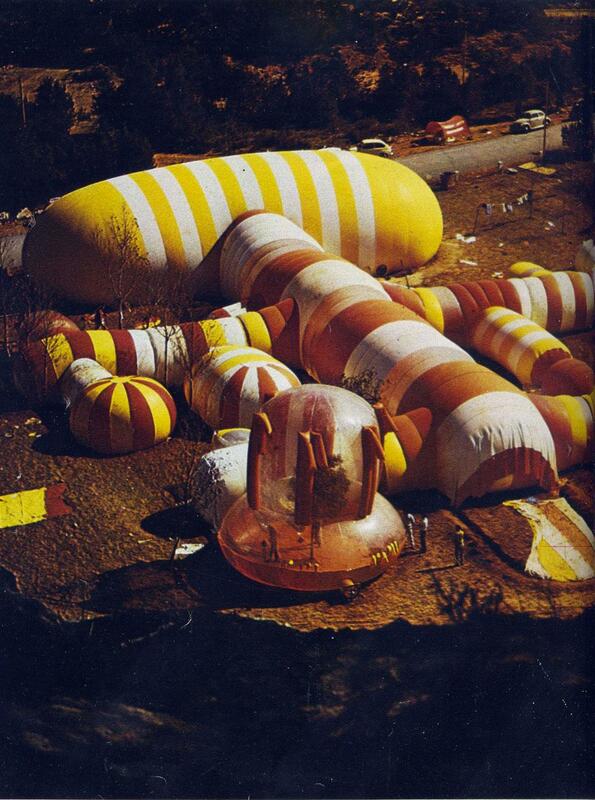 Found photograph in the former car repair shop that existed before Rampa. 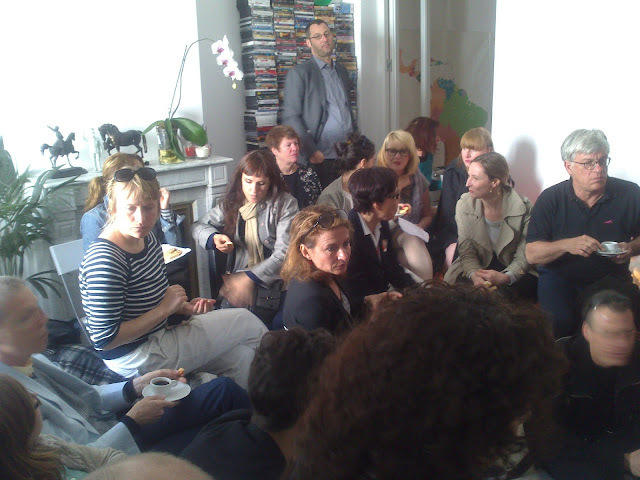 IKT members listening to Rampa's presentation and questions on curating and the artist-curator relationship. Bus departs for Colección Inelcom at the Ciudad de la Imagen, Pozuelo de Alarcón, Madrid. Artistic direction of the collection: Vicente Todolí. 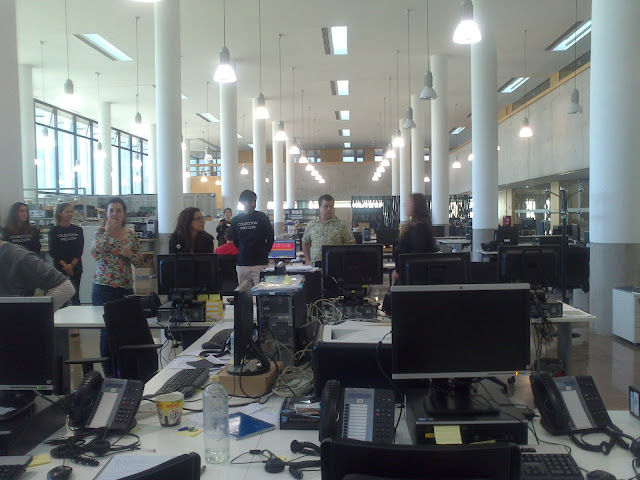 The circa 3,000m2 headquarters at Ciudad de la Imagen, hold 72 works by 24 artists, including Pavel Büchler, Anthony McCall, Markus Schinwald, Ernesto Neto, Sophie Calle, Kader Attia, Candice Breitz, Ceal Floyer, Fiona Tan and Fernando Bryce's 'Work in Progress' (2006) a suite of 80 ink drawings (below). 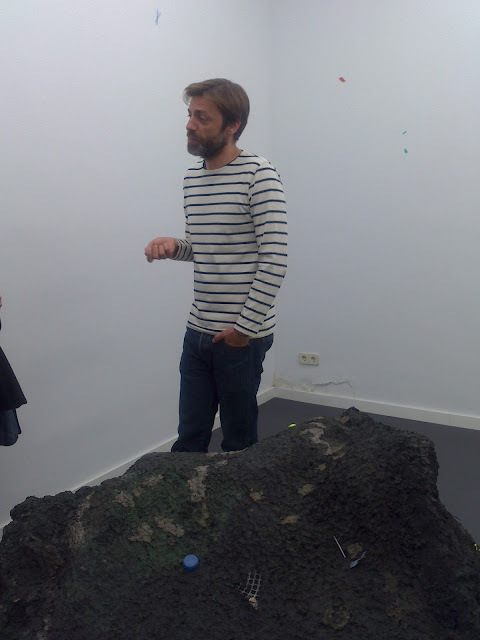 Visit artists studios: Fernando Sánchez Castillo and Cristina Lucas. How many curators can you fit in an artist studio? Espacio Valverde group show included a work by Antonio R. Montesinos, one of the members of Rampa. AVE back to Barcelona... end of journey.